I am honored to present to you the Annual Report for the Standing Committee on Libraries and Education Technology for the 2003 legislative session. My first year as Chair of the Committee has been an exciting and productive time. I look forward to working with you and the rest of my colleagues to continue providing much needed support and assistance to New York's Library community. Libraries have played an important role in my life for many years now, both personally and professionally. As a teacher, I saw first hand the impact that a strong school library plays in the overall educational experience of students. Later, as a trustee of my public library I further saw the important role that public libraries play in the continuing education and cultural development of New York's communities. That is one of the many reasons it was so personally gratifying for me to see the Assembly work with such dedication to first restore the devastating funding cuts proposed by the Governor and then over-ride his veto of that restored funding. I would like to take this opportunity to thank the members of the committee, as well as all of the members of the Assembly Majority, for their commitment and dedication to the work of the committee. I would also like to thank you for your support of this Committee's important issues. The Libraries and Education Technology Committee has jurisdiction over legislation introduced concerning the many issues affecting public, academic, school and private libraries. The Committee, created in 1997 under the leadership of Assembly Speaker Sheldon Silver, handles legislation affecting the administration and funding of libraries and library systems across New York State. The Committee develops and reviews legislation which enables New York's libraries to meet the challenges of the information age. Today's explosion in information technology has placed new demands on libraries. As libraries are called upon to play an expanding role in educating New Yorkers, it is imperative that they receive the attention and support they require to meet these new challenges. The work done by the Committee assists libraries in sustaining the infrastructure and staff resources necessary to allow all New Yorkers access to technological advances available through New York's vast library community. Libraries play an important role in the educational and cultural development of all of New Yorkers. Through a wealth of electronic and print media, New York's libraries provide individuals and communities with exposure to information that broadens their intellectual and cultural experiences. New York State has over 7,000 libraries which serve our citizens in many capacities. Many of these institutions are among the largest and the best in the United States. Of the forty largest libraries in the United States, six are located in New York, more than in any other state. New York's largest library, the New York Public Library, contains over ten million volumes and is among the top research institutions in the world. New York's libraries provide support for students, teachers, researchers, readers, job seekers, entrepreneurs and many others who need assistance in finding and using information. The libraries of New York State work hard to meet the needs of the populations that they serve. However, those needs may vary widely, even within one district. Public, academic and school libraries cannot serve their patrons without an adequate and consistent source of funding. The New York State Assembly has long supported libraries and the educational, cultural and economic roles they play in their communities. The Assembly Majority is committed to providing libraries with the resources to meet the needs of all our State's citizens. Providing these resources requires a well-focused policy commitment as well as significant State financial support. The Assembly has made increased funding for New York's libraries a priority. To meet the funding needs of New York libraries, Chapter 917 of 1990 was enacted, establishing an appropriation which was designed to provide sufficient funding for both library systems and individual libraries. Unfortunately, many of the Assembly's efforts have been devoted to maintaining rather than increasing funding in recent years. The 2003-2004 budget approved by the Legislature included $88.9 million in funds for Chapter 917 programs, which represents no increase from the previous fiscal years funding. Despite the flat funding level, this represents a significant victory on behalf of libraries. The Governor's proposed budget would have eliminated $13.3 million, or 15% of the funding guaranteed to public libraries under Chapter 917. The Senate and Assembly were able to work together to restore this important funding to libraries. This restoration of funding was tremendously important to maintaining library services, as such a reduction would not only have meant a loss of State funding, but would have also jeopardized the State's Federal funding through the Library Services and Technology Act (LSTA). This federal program currently provides $9 million to New York State, but continued funding at that level is based in part on a maintained level of State funding. Other measures designed to increase library funding were also considered by the Libraries and Education Technology Committee. A.8364, Benjamin; Chapter 572 of the Laws of 2003 This law allows local libraries who receive state aid for construction three years to complete the construction project rather than one year. A.8366, Eddington; Chapter 571 of the Laws of 2003 This law makes changes to the way in which libraries receive their medical data. Previously, the State Education was entering into contracts with approved agencies to provide information and support to the nine reference and research library resource centers, who then in turn shared that information with all the libraries and library systems in their areas. Now, medical information services funds will be awarded to the libraries through direct grants administered by the State Library, reducing the overall administrative cost for the program. A.5565-A, Galef This bill would create a State scholarship fund of $250,000 to provide up to 50 scholarships for individuals who are in programs to receive a Master of Arts in Library Science. Recipients of these scholarships would then be required to provide library related services in New York State for a minimum of 4 years after the completion of their degree. This bill was reported to the Ways and Means Committee. A.3072 Dinowitz This bill would create an annual Friends of Libraries Week designed to highlight the significant contributions made by Friends of Libraries organizations throughout the State. This bill passed the Assembly but died in the Senate. A. 4850, Pretlow This bill would provide supplemental financial assistance to library systems which merge. Currently, library systems which merge receive less state aid as a new, single system than the individual systems would have received. This bill passed the Assembly and died in the Senate. A. 4941, Pretlow This legislation would create a revolving loan fund for libraries, enabling them to fund needed capital construction. Loans would be awarded to eligible libraries and be repaid at low interest. Eligible projects would expand space for library services and increase access for the handicapped. This bill was reported to the Ways and Means Committee. A.8365, Bing This bill would protect the funding for libraries in areas which have lost population between the 1990 and the 2000 census as we increase aid to those libraries that are serving a greater population. State library funding is based on both the size of the geographic area and the population that the library is expected to serve. Therefore, many of the areas who have had a decrease in population are also the areas that would suffer the most from a decrease in State funding. This proposal would ensure that all libraries receive at least as much money as they did the previous year. This bill was referred to the Ways and Means Committee. New Yorkers are blessed with one of the richest assortment of library resources in the nation. With sometimes limited resources, New York maintains hundreds of chartered public or association libraries, 23 public library systems, 9 reference and research library systems and numerous specialized libraries. In addition, 42 school library systems serve the over 1400 school libraries located in elementary and secondary schools. From the New York Public Library, nationally recognized as one of the top research libraries in the world, to the smallest community-based book exchange, libraries play an important role in the lives of New Yorkers. A. 887, O'Connell; Chapter 271 of the Laws of 2003 This law authorizes a referendum to establish a library district in the Village of Stewart Manor and establishes election and governance procedures for the district. A.5262, Bradley; Chapter 285 of the Laws of 2003 This law authorizes a referendum creating the Town of Pound Ridge Library District and establishes election and governance procedures for the district. A.8139-A, Gunther; Chapter 392 of the Laws of 2003 This law authorizes a referendum creating the Mamakating Library District and establishes election and governance procedures for the district. A.8567-A, Ferrara; Chapter 226 of the Laws of 2003 This law authorizes a referendum creating the Brookville Library Funding District and establishes election and governance procedures for the district. A.7127, O'Connell; Chapter 80 of the Laws of 2003 This law changes the beginning of the Carle Place Public Library Funding District's fiscal year from July first to January first. A.7861-A, Alfano; Chapter 214 of the Laws of 2003 This law changes the boundaries of the North Valley Stream Library Funding District, the East Franklin Square Library Funding District, and the North Malverne Library Funding District. A.8624-A, Sidikman; Chapter 399 of the Laws of 2003 This law makes administrative changes to the current laws governing the election procedures and fiscal cycle of the Gold Coast Public Library District. A.1802, Burling; Chapter 274 of the Laws of 2003 This law will allow the Caledonia Public Library to seek financing and construction assistance from the State Dormitory Authority. While the 2003 legislative session resulted in a number of victories for the library community, there is still a great deal of work to do in the 2004 legislative session. While the 15% proposed funding cut was restored, no additional funds were added for the fifth consecutive year. In addition, funding levels are still being based on the 1990 census numbers, rather than the 2000 census numbers, which is a great hardship to many libraries. While the State has not updated their population figures to reflect the current State population, the federal government has. This change has already resulted in a small loss of federal funding and could lead to additional losses next year. 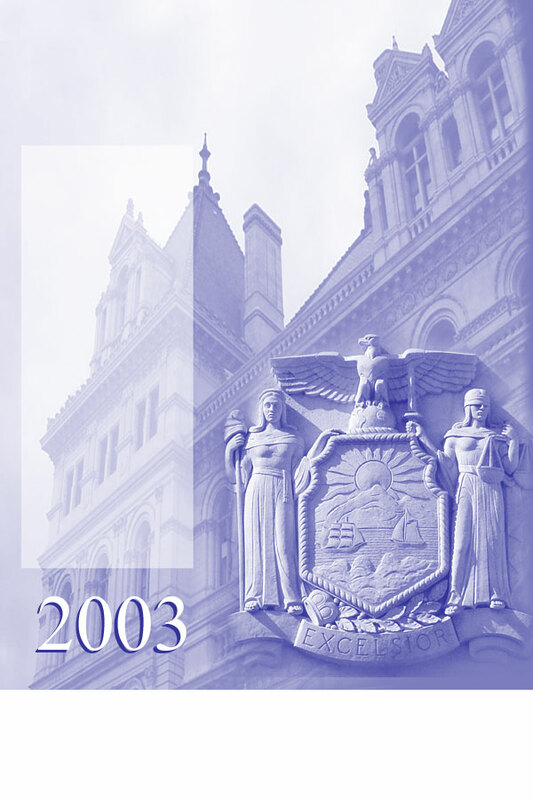 The Committee's goals for the 2004 session will include addressing these funding problems, working to infuse more funding to existing projects such as the New York Online Virtual Electronic Library and the Talking Book and Braille Library and looking to provide funding to new projects, including the New Century Libraries. A.877-A, O'Connell 271 Establishes the Fernwood Terrace-Stewart Manor Library Funding District. A.1802, Burling 274 Allows the Caledonia Public Library to receive financing and construction assistance through the State Dormitory Authority. A.5262-A, Bradley	 131	 Establishes the Town of Pound Ridge Library District. A.7127, O'Connell	 80	 Moves the beginning of the fiscal year for the Carle Place Library Funding District from July 1 to January 1. A.7861-A, Alfano	 214	 Changes the boundaries of the North Valley Stream, East Franklin Square, and North Malverne Library Funding Districts. A.8139-A, Gunther	 392	 Establishes the Mamakating Library District. A.8364, Benjamin	 572	 Extends the time frame for completing State supported library construction from one to three years. A.8366, Eddington	 571	 Makes changes to the funding system for reference and research libraries providing consumer health and medical services. A.8567-A, Ferrara	 226	 Establishes the Brookville Library Funding District. A.8624-A, Sidikman	 399	 Makes administrative changes to the election practices and fiscal cycle of the Gold Coast Public Library District. A.8953, O'Connell	 620	 Makes technical amendments to Chapter 80 of the Laws of 2003.